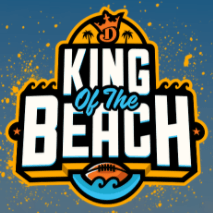 DraftKings have announced their $1 Million King of the Beach (KOTB) championship! The 1st place winner will receive $100,000! All 180 qualifiers will cash out! The DraftKings live championship will be held on December 3, 2017 (NFL week 13) in Key West, FL! The top 50 finalists of the 180 qualifiers competing in the initial round on Sunday, November 19th (NFL week 11), will receive a VIP package ($6,000 value) including a four night trip for two, $1,200 credit for round-trip airfare, and transportation to/from the airport. The accommodations are in Key West, FL, arriving on November 30, 2017 and departing on December 4, 2017. The live final for the 50 finalists includes the morning and afternoon NFL games scheduled on December 3rd. You may qualify up to five times for this tournament through November 12th, 2017. The DraftKings King of the Beach is a qualifier event only. Entry fees for the qualifier contests range from $1 to $1,000. 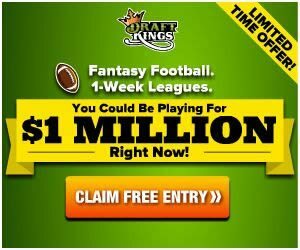 Fantasy footballers, don’t miss out on your shot at this guaranteed $1 Million prize pool in KeY West, FL!